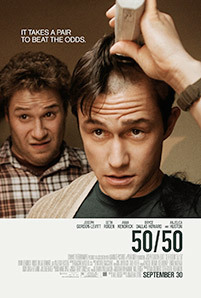 Joseph Gordon-Levitt, Seth Rogen and Anna Kendrick star in the comedy drama 50/50. Inspired by personal experiences, “50/50” is an original story about friendship, love, survival and finding humor in unlikely places. Joseph Gordon-Levitt and Seth Rogen star as best friends whose lives are changed by a cancer diagnosis. MPAA Rating: R for language throughout, sexual content and some drug use. Inspired by personal experiences, “50/50” is an original story about friendship, love, survival and finding humor in unlikely places. Joseph Gordon-Levitt and Seth Rogen star as best friends whose lives are changed by a cancer diagnosis.